Do you love fresh spring asparagus? The first pick of the season always tastes the best! This pasta salad is enhanced by the clean taste of lemon juice and lemon rind. The capers provide a bite and the pecans provide a crunch. My kids didn't like the asparagus in the salad, but liked the rest of the salad. I did like the asparagus in the salad. Next time I might make the salad without the asparagus for them. This pasta salad was made with foraged asparagus. Going foraging for asparagus is one of the delights we have found in living in the sticks like we do. My husband likes to takes the kids on walks and forage for asparagus. No, we don't go where we aren't wanted when we are foraging! 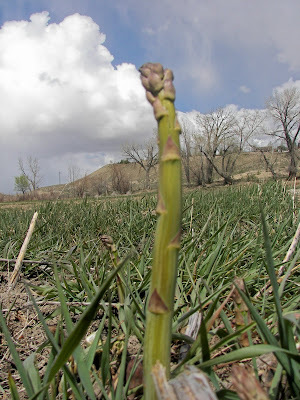 My husband snapped these pictures of asparagus while foraging. I think the photos are beautiful! This recipe was adapted from Culinate. In a large bowl, whisk together the lemon zest and juice with the olive oil. 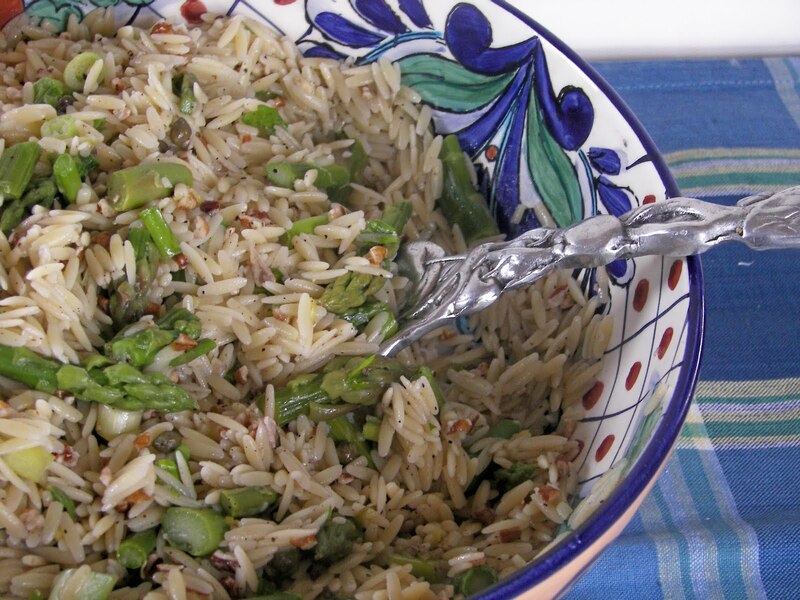 Add the chopped green onions, cooked asparagus, cooked orzo, parsley, capers, and nuts. Toss until the pasta is coated with the dressing, then season to taste with salt and freshly ground black pepper. Note: Make sure that you do not overcook the asparagus; after cooking run under cold water or set in ice bath. This looks absolutely delicious!!! What a great combination of flavors! How cool!! That must be so much fun! And my kids would probably agree with yours, but I LOVE asparagus! Yummy! Hey Joni... 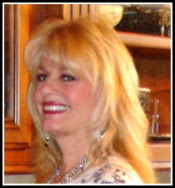 I used to live in Sandy for a year and St. George for 14 yrs but now I live Dallas Texas. I am LDS. The metal cloche I bought at Hobby Lobby. You just got a new Hobby Lobby in Sandy...I was just there. I was helping my daughter move into her new apartment just a few weeks ago and that Hobby Lobby is a nice one. I can't remember if I saw any when I was there. The orange pitcher also has a beehive on it and I got that at Home Goods or TJMaxx. Wow, You are sure a busy girl. Love your opening pictures! You are amazing. I love asparagus! Your dish looks so yummy, and thanks for the recipe! Rice and asparagus are my favorite, so it is a must try for sure. I DO love asparagus and that looks incredible!! I LOVE!!! asparagus and the addition of pine nuts sounds AWESOME!!! Your new header looks fabulous too. I see your sister has a blog too. I will check it out. By the way, I just wanted to tell you that my 13 YO Daughter sometimes reads your daughter's blog and she is now thinking of starting a blog too! The salad looks heavenly, and I will definately be making it soon. And I love your blog, it is delightful. Aren't daughters wonderful! My daughters, The Style Sisters insisted I start my own blog and so here I am. 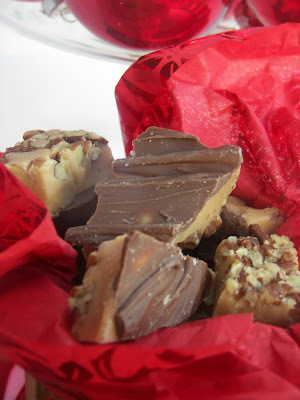 I really love hearing from so many lovely women and hope you will drop by and visit my chocolate world. Have a grand weekend. Love orzo & asparagus...I'd love this recipe! Joni, This is an excellent recipe. I am going to make this next week. Look for it on my weekly menu with a link to this post! Yummy!!!!!! I can't wait to taste it! Thanks for making my menu planning so much easier. Yum, I love asparagus. Actually this is a recent love, I was too scared to eat it before. Joni, I love your mosaic header! You are such an awesome cook and blogger! The salad looks great! 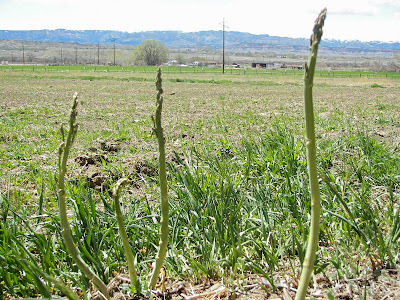 I didn't know asparagus grows wild - or perhaps it's more a case of being at an abandoned property/former farmhouse. Have a wondeful weekend! That looks really yummy! I love asparagus! Asparagus is on everybody's menu right now. This looks so delicious and I really like the addition of pecans and capers. 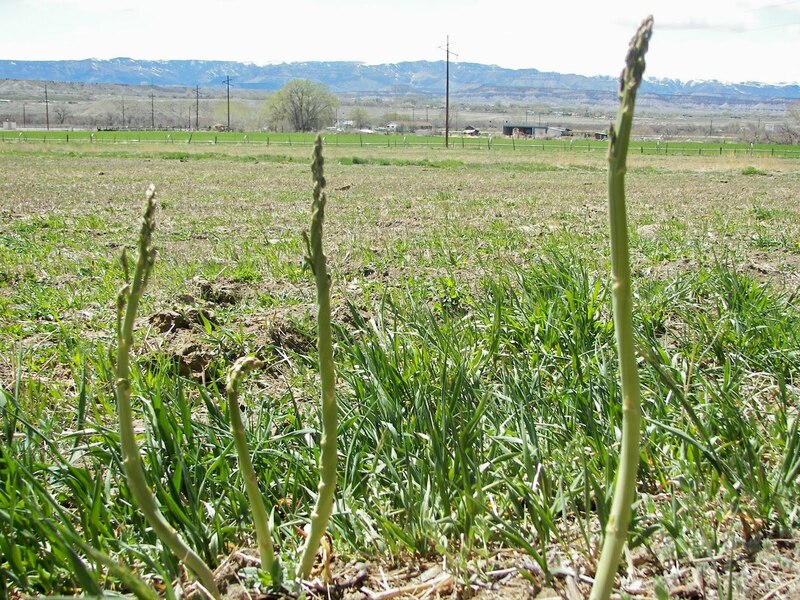 It's very interesting to see how asparagus grows. I've never seen it growing wild. Maybe I'll be lucky one of these days and find some. Thank you for this great sounding dish. I just posted my menu and I am making this. I posted a link to this post.